The path the balloon took was pretty strange, with the wind shifting between ascent and descent, and so we had a lot more driving to do than usual. The primary GPS/radio worked perfectly, and we got super-lucky with the recovery, picking up the package ~15 minutes after it hit the ground. The video camera overheated and failed before launch (booo!) and we're still working on the instrument data, but all signs point to some new and interesting results at the highest altitude we've ever run. 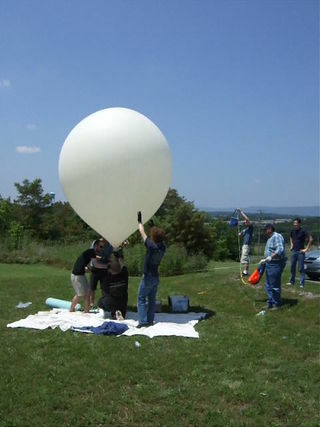 What challenges are left for the Spaceblimp project? Get involved: subscribe to [the Spaceblimp mailing list] and help us figure it out! Visiting from another planet? Here's more about us. Want to help us do more awesome stuff? Make a tax deductible donation to our .org! Photos have been uploaded to http://www.flickr.com/photos/itechgeek/sets/72157627058450849/. 10:00 AM, Launch should take less than an hour. 146.685 MHz simplex (this might change, please monitor Twitter (@HacDCSpaceblimp) and mailing list for updates. The secondary radio was actually a GSM cell phone module, and broadcasted its data when in range of a cell tower. It broadcasted both GPS data for tracking, and a lot of the sensor data for science. It also twittered through Society Of Robots Twitter Feed. This page was last modified on 3 April 2012, at 00:57.